Looking for best through-the-wall air conditioner, you've come to the right place. This through the wall air conditioner buying guide is your place to research this type of room air conditioner. A through the wall air conditioner is much like a window air conditioner. The main difference besides installation location is that a through the wall unit has a sleeve that is first installed into the prepared wall space. The AC then slides into the sleeve. More differences are listed below. AKA: Through the wall air conditioners are also called built in, thru-wall, wall mounted, in wall, wall air conditioners and similar variations. Our Window AC Guide: We have completed a large, comprehensive Window Air Conditioner Buying Guide with Brand Reviews and much more. Because the two room air conditioner types are so similar, there is a lot of information relevant to through the wall air conditioners too. This is a more concise guide. Here are common questions asked about through the wall air conditioners. Q: What wall AC sizes are available? A: Units are made from 8,000 to 25,000 BTUs, but most are in the 8K to 14K BTU range. Q: Do through the wall air conditioners remove humidity? A: Yes, just like any air conditioner, a wall unit will condense moisture from inside your home and drain it to the outside. Several pints of air per hour can be removed, and the lower humidity allows you to feel cooler. Q: Can a wall unit cool more than one room? A: They serve a single room like a bedroom or one large open zone like a living room / kitchen area. Q: How much power does a built in air conditioner need? A: Most require a 110-120V outlet. Larger units require a 220-240V outlet. There is no hard and fast dividing line. For example, LG makes 10,000 BTU units in both 115V and 230V models. Q: What’s in the Box? What’s not in the box? Yes: The through the wall air conditioner and a trim kit are standard. Probably: Most units also include a remote control, but not all. Probably Not: A few units include a wall sleeve, but most don’t. Sleeves are sold separately as an accessory when not included. Some homeowners prefer a finished wall opening rather than a sleeve. Q: What do EER and CEER mean? A: They are efficiency ratings. EER is energy efficiency rating. CEER is a newer rating that built-in ACs must use. It is combined energy efficiency rating. The difference is that it factors in energy used by the wall unit while it is plugged in but not running. CEER is slightly lower than EER on through the wall air conditioners for this reason. The higher the ratings, the less energy the wall unit uses. Depending on CEER and size of the unit, some are certified by Energy Star. Q: Do wall air conditioners heat too? A: Some wall units have built-in heat elements, like a space heater. They do not heat with the same technology as they cool, unlike split system heat pumps or ductless mini split heat pumps. Q: What is an Energy Guide? Given the size of the unit, how much it will cost to run annually in an average climate and average electricity costs. Q: Is a through the wall air conditioner a room air conditioner? A: Yes. Window, wall and portable air conditioners are all types of room air conditioner. Q: Is a wall air conditioner the same as a PTAC? A: No. A packaged terminal air conditioner or PTAC is the hotel-type unit that sits on the floor of the room. How does a through the wall air conditioner differ from a window air conditioner? Size: The size range for window air conditioners is 5,000 to 36,000 BTUs but just 8,000 to 25,000 for wall units. Features: The features such as timers, fans speeds, remote controls and cooling modes are the same. These features are fully explored in our Window AC Guide and summarized below in the How to Buy section. Efficiency: CEER ratings are about the same for window and through the wall air conditioners. However, because a built in AC has a tighter fit than a window AC, it will use less energy during a cooling season. In the Window AC Guide, we discussed pros and cons vs. central air conditioning. If you’re deciding between a central AC and one or more wall units, that’s a helpful discussion. Here are pros and cons of a wall unit vs. a window unit. Through the wall air conditioner pros: Here are reasons to consider a wall air conditioner. This table shows price ranges for the most common size wall mounted air conditioners. The price ranges in the table are quite wide. Here are the factors that affect cost. Efficiency: Energy Star wall air conditioners cost 15% to 30% more than the least efficient models. Supplemental heat: Including a space heating element in the unit raises the cost by $50 to $150. Features: The more features a unit has, the higher the cost. Popular features are discussed in the last section. Quality: Brand quality ranges from basic to better to best. See the next section for the major brands and their quality ranking. These are the top-selling brands and an overview of what they offer. 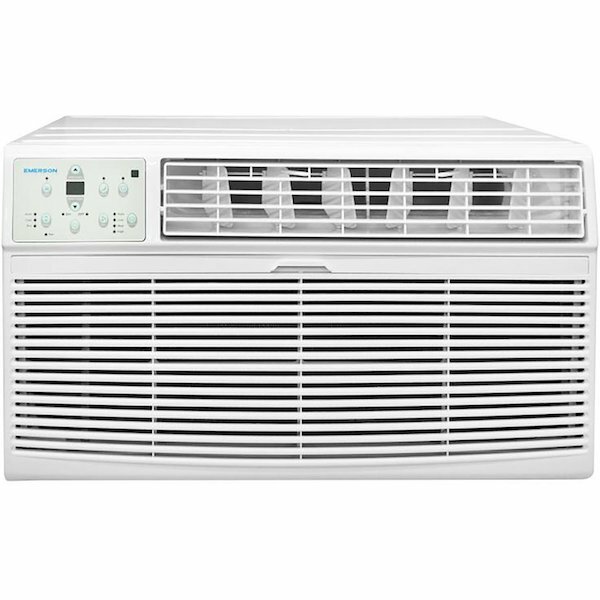 Arctic King (Basic): Arctic King through-the-wall air conditioners offer affordable prices and good features in units from 8,000 to 14,000 BTUs. They are sold widely including in home improvement stores like Home Depot. Koldfront (Basic): Koldfront through-the-wall air conditioners enjoy good online sales. They range from 8K to 14.5K BTUs. Some are packaged with a sleeve for convenience. They are one of the most affordable through the wall air conditioner brands. Frigidaire (Better and Best): Frigidaire has a large lineup of wall air conditioners from 8K to 14K. AC-only and AC with supplemental heat models are available. The lineup is called Frigidaire Built-in room air conditioners. About 30% of them are Energy Star through the wall air conditioners. Friedrich (Better and Best): Friedrich’s Uni-Fit line is sized to fit into universal wall sleeve sizes for easy installation. They are officially called Friedrich thru-the-wall air conditioners. The Friedrich WallMaster air conditioners are premium wall units that cost more than shown in the table above. WallMaster built-in air conditioners have commercial-grade components, though they’re sold as residential units too. The WallMaster Series is available in capacities from 8,000 to 14,500 BTU and cost two to five times that of most brands. GE (Better and Best): GE makes a pricey but limited range of built-in room air conditioners. Sizes are 6,000 to 12,000 BTUs. Most are Energy Star, and all come with a remote. About a third of the units have supplemental heating. Haier (Better): Haier makes five through the wall air conditioner models from 8K to 12K BTUs. They are called Haier Wall and Built-in air conditioners. LG (Better): There are about 10 LG through-the-wall air conditioners. They range from 8K to 12K BTUs and four of the models have supplemental heat. The US Department of Energy has developed a sizing chart for room air conditioners. 1. The room is 400 square feet. Per the chart, the through the wall air conditioner should be 10,000 BTUs. 2. The room is on the west side of the house, so gets direct sunlight in the afternoon and evening. According to the DOE guidelines, increase capacity by 10% or 1,000 BTUs. 3. Only one or two people typically use the room, so consider raising capacity by 600 BTUs. 4. Total cooling capacity required is 11,600 BTUs. Your options from most brands are 10K or 12K BTUs, though there are a few 11K BTU units made. In a warm climate, it makes sense to choose a 12,000 BTU unit. This gives you some cushion too if there are more people in the room. If your climate is cool or you have a lot of cloudy weather, then an 11K through the wall air conditioner might be fine. Here are a few built-in AC buying tips that will ensure you like the model you choose. Get the size right: Proper sizing is critical to choosing a wall air conditioner that will adequately cool the space without. If the AC is much too big, it will cool the room quickly and shut off before it can remove sufficient humidity. You’ll have cool, damp air, and that’s not very comfortable. Obviously, if it is too small, it won’t keep up with the heat. Efficiency: If the wall air conditioner is your main source of cooling, then we recommend investing in a unit with Energy Star efficiency. If it supplements a central AC and doesn’t run a lot, then a less efficient, more affordable wall mounted room air conditioner is a good choice. Features: We suggest that you don’t get sold on features you won’t use. But it’s worth paying for those you’ll enjoy. Timer and programmable start: These features allow you to program when the unit will turn on and how long it will run. Benefit: Using a timer and programming the unit’s cycle is the best way to save on energy cost and still have a comfortable room. Program the AC to turn on shortly before you want to use the room, and it will be cool. Plus, you won’t waste energy by leaving on a unit when nobody is in the room. Supplemental heat: A small space heating element is built into the air conditioner. Benefit: These heaters are designed to supplement a furnace in winter or to add a little heat on a cool spring or autumn day. Dehumidify mode: This mode turns the AC into a dehumidifier that removes moisture but doesn’t cool. Benefit: Sometimes the air is damp and cool. You don’t want air conditioning, but removing some of the humidity would be nice. Here are the top models in important categories. This highly rated yet affordable Energy Star certified AC delivers 8,000 BTUs of cooling. It will reduce energy costs while making any space very comfortable. It’s hard to beat Koldfront when it comes to value. In fact, this unit was considered for the Best Features category. This is an Energy Star air conditioner, so it will keep cooling costs in check. The AC is available in 8,000, 10,000 and 12,000 BTU sizes too, so you’ll find the right size for your room. It has Dehumidification mode, 24-hour timer, 4-speed fan and more. This unit runs at just 53db on low and only 56db on the highest speed. With Energy Star efficiency, it will reduce energy use and cost too. The Quiet Kool has plenty of features too including timer, remote, auto-restart after power outages and a 3-speed fan. This through the wall air conditioner enjoys the highest ratings in its class with about 90% positive reviews. It delivers more than 10,000 BTUs of heat with the 3450-watt space heater, enough to take the chill off the room. Features include a timer, remote and four modes to heat and cool the way you want.